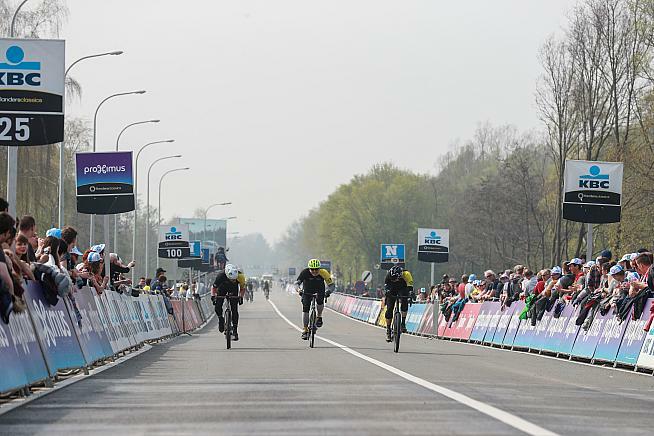 The Tour of Flanders offers four different routes for sportive riders on the day before the main race. 16,000 amateur riders get to test their cobble riding skills on the Saturday and then you can stay and watch the pros on the Sunday. The four distances are 229km, 174km, 139km, and 74km. Long ride - 229km - The longest of the possible distances but not as long as the pros ride. Like the pros, you start in Antwerp and ends in Oudenaarde. This takes in all the major climbs that the pro riders take in but the first 80km is pretty flat and has no cobbles. After that there are plenty of cobbles. Total climbing in the day is 2,160 metres. Even if the weather is dry, you will find the cobbled climbs in the last 50km much harder when you already have 170km in your legs. But this will give you a sense of what it is like for the pro riders. Medium ride - 174km - The route starts and ends in Oudenaarde and takes in all the classic climbs including the Muur. It features 1,853 metres of climbing over the day and has fewer riders on it, although if you are a relatively speedy rider then you are likely to catch some of the slower riders from the shorter route when you go up the Kwaremont and Paterberg. Short ride - 139km - This is the most popular route among Flandriens with 1,497 metres of climbing and the first climb coming after 7km. The route starts and ends in Oudenaarde. Because of its popularity you will find that the climbs are pretty crowded and you may have to walk if it is too crowded or someone comes off in front of you. The main difference between this ride and the medium ride is that the short ride does not take in the Muur. Fun ride - 74km - You get to take in the Kwaremont and Paterberg but if you've especially made the trip to Belgium then this might be a bit short a ride for you. This would be a good taster for someone who is nervous about riding on cobbles for the first time but you may be better off just coming on another weekend and riding the route on your own rather than paying 30 euros and being caught behind lots of slow riders. Having spoken to a lot of riders who have ridden the Ronde van Vlaanderen, we think that most riders would most enjoy the 174km or 139km routes. One rider who has ridden all three told us: "The first year I thought that the only 'proper' route was the longest but the first 100km was pretty dull and there were a lot of headwinds and crosswinds, which just meant I was exhauted for the interesting part of the Ronde. I've ridden it five times since and done the medium route three times and the short route twice. If it is dry I would recommend the medium route and if it is cold and wet then the short route is perfect. I would never ride the long route again." On balance, the Sportive.com team think the medium (174km) route is marginally preferable because you get to ride the Muur and because there are fewer riders, meaning less congestion. But we would switch to the shorter route if the weather forecast was abysmal, not least because far fewer riders will attempt the short route if the conditions are bad.